Just four hours flying time from the UK is the island of Gran Canaria, where the average daily temperature even in winter rarely drops below 20 degrees. This October the island had its hottest ever autumn with average daily temperatures of 30 degrees. But its not just the weather that makes the island an attractive destination. After all there is only so much beach and lazing around that one person can take isn’t there? It’s is almost a mini-Continent, with beautiful mountain ranges, great for trekking, hiking and biking. And it also has one of the largest cities in Spain, Las Palmas which has all the big town stuff such as shops, clubs, an opera house and is a main stop over for large cruise ships – but also has a beautiful historical centre with some of the best tapas bars. Every Thurday, between 13 and 18 hrs you can hit the Tapas Trail in the old city and pop into all the participating bars and have any tapas and a beer for 3.5 euros. We head to Bien me Sabe in Calle Armas no 13. They serve mouth watering tapas, all home made – and we can see mother is there making them. The potato tapa is served with a garlic mayonnaise sauce with sweet Spanish paprika. The quality of wines is also very high with superb Riojas and surprisingly great wines from Grand Canaria which are more expensive because they are made in smaller quantities. This city has a fascinating history, mostly because of its position as a maritime crossroads between Europe, Africa and the Americas. It also had a part to play in the history of slavery and the growth of British business interests. Christopher Colombus also stopped over for repairs etc and a guide (see our recommendation in the fact box) can point out all this. There are lovely former merchant homes where the size of the wooden balconies was a status symbol and amazing wooden doors from the 18th century along narrow pedestrian streets. One of the loveliest hotels on the island, is the Santa Catarina which was build by The Grand Canary Company of the City of London. Built in colonial hacienda style, it stands resplendent in the middle of beautiful botanical gardens where you can see palms and other exotic plants which are centuries old. The hotel’s wealthy European clientele would visit to take the natural waters in the hotel’s spa which is still in existence. Sadly, we hear that the hotel, lovely as it is, is in danger of closing. It’s grand terrace (left) was empty on the day we visited. But what a great place to have a glass of cava? So where is the best place to find a tropical paradise on the island? We headed to the south, where the weather is warmer and where the best hotels and beaches are. 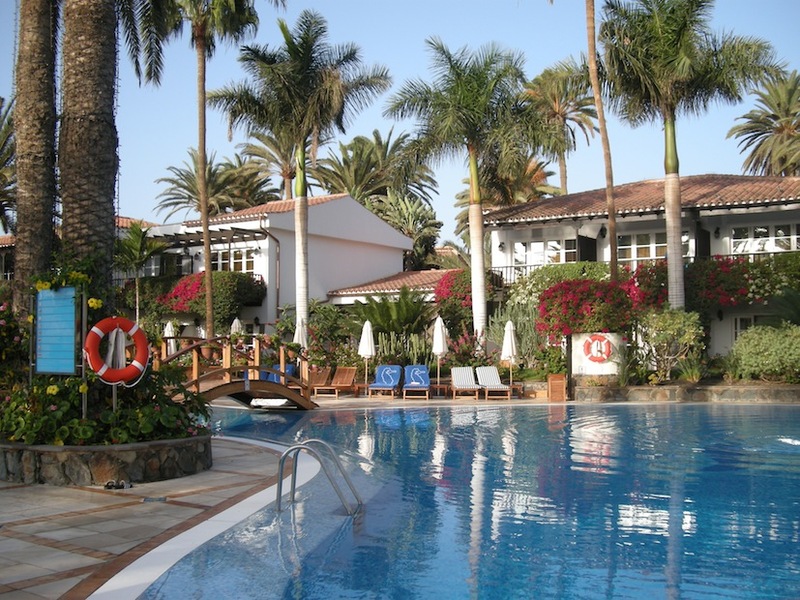 The resort of Maspalomas is the more upmarket on the island. And we split our time between the two five star hotels, the Seaside Palm Beach Hotel resort and its five star sister, the Seaside Grand Hotel Residencia, the only Leading Hotel of the World on the island. Both of the hotels are luxurious and offer great food and service. The difference is that the Palm Beach is more of a resort, probably more family and children orientated, while the Grand Hotel Residencia is more exclusive, quieter and caters for an older clientele – though we did see children at the latter. You can ‘cross-dine’ in either hotel by prior arrangement. Both of these hotels are set in the most beautiful landscaped gardens with 1,000 year old palm trees. One spectator sport is watching an expert scale the tree to remove a falling frond – amazing with a just a piece of leather. In October its now high season but there is no sensation of crowds – the gardens are huge and there are choices of pools and places to eat. And if you tire of being pool-bound you can always head to the nearby cafes and shops. And you can take a bike and cycle along the (flat) seafront, take a walk up Sahara-style sand dunes or along the beach which is not at all built up or commercialised. The beach is vast and not even crowded on a Spanish holiday weekend when we were there. If you feel adventurous hire a car or go for a hike in the mountains. Grand Hotel Residencia is set in breathtakingly beautiful garden and built in Spanish hacienda style, designed by the Parisian architect Alberto Pinto. The hotel cleaning trolly glides by without a sound. I tried the signature treatment Pantai Luar, which is a traditional Indonesian body treatment. Herbs with medical properties are heated to 120 degrees C with Panai oil in small cotton bags and then used for a deep tissue massage with fast movements. This helps aching muscles relax. I desperated need this treatment – after spending my days huddled over a computer I have got an annoying and occasional pain in the neck. This hot compress (pictured below) are held against the painful areas to relieve congestion. Costs Euro 98 for 55 minutes and well worth it. I felt great afterwards. I also learned a lot about the island from my lovely therapist Hortensia, who came all the way from Peru years ago and has never married. “I have my dog,” she tells me. She has a point! If you are looking for somewhere more lively then the Palm Beach is the place to find it. It’s a bigger hotel, but is under the same management, and is still very high end. Even though it is caters to families, the children we saw were very well behaved – perhaps because they weren’t English! You can eat a la carte or from the buffet. And one thing I really like is that breakfast goes on to at least 11am. The service at the hotel was excellent, with waiters frequently offering to bring fresh coffee without being asked. And you are never asked to leave your table so it can be cleared no matter how long you hang around, morning, noon or night! It has a disco/nightclub and there is music outside by the pool in the evenings. There are three pools, freshwater, saltwater and one for children. There are also various organised activites such as water aerobics, yoga and tchi chi – but these are very low-key affairs and quietly held in the tropical gardens – pictured left. There is also a well-equipped outside gym – with new and working Italian-made Technogym equipment and weights – and bottled drinking water! There are saunas and a naked sunbathing area nearby – behind a fence – so no offence is caused I assume. I opted for a new Natura Bissé – the ultra gorgeous Spanish brand – treatment which was not on the menu while I was there – an exfoliation using sea salt and Rioja vinegar followed by an envelopment in a body moisturising treatment made with oranges. I have to say that this was amazing – it took off all the dead skin from all over, particularly my back and feet, taking off years from my skin. The therapist, who told me he came from Santiago de Compostella, was obviously enjoying his work as he shouted “yes” with each long stroke of exfoliation. After a shower I was then covered head to toe in the moisturising vitamin C cream which was white and had real orange pieces in it – I couldn’t see myself but I must have looked like the Creature from the Black Lagoon! I was then wrapped up in one of those heated water beds and left for about 20 minutes while my skin sucked in the moisture. Weeks later my skin is still looking great and the nasty flakey skin has not returned. This cost about 90 euros and took 60 minutes. I loved both these resorts – great places, great food, great service and beautiful surroundings and would love to go back – particularly given our awful weather! Double rooms at the Seaside Palm Beach Hotel***** cost from £117 per person per night based on two people sharing on a half board basis. For more information and reservations for Seaside Palm Beach Hotel***** visit www.hotel-palm-beach.co.uk or call direct +34 928 72 1032. For more information and reservations for Seaside Grand Hotel Residencia*****GL visit www.grand-hotel-residencia.co.uk or call 0034 928 72 3100. EasyJet and Ryanair fly to Gran Canaria four times a week and cost from £83 per person including taxes. This entry was posted in Spain and tagged Botanical garden, Grand Residence, Maspalomas, Palm Beach Maspalomas by Editor. Bookmark the permalink.